I think my computer senses that I'm about to ditch it because we came back from a short trip and I loaded new photos, but the graphics-card hardware acceleration doesn't seem to work anymore, turning my use of Lightroom from a zippy-responsive experience to a painful, laggy frustration. So, no new photos for a while... I ended up ordering a Mac Pro, and currently have 8TB of disk sitting in a box by my desk waiting for the Mac to arrive. So, today I'll post about a new addition to my blog that I quietly added a week ago, highlighted with the red arrow in the screenshot at right, of my blog's home page: an interactive Google Map overlaid with photos from my blog. The default location is Kyoto where I live, but like any Google map, you can visit anywhere in the world, and if I've posted geoencoded photos on my blog from that part of the world, they'll start to show up. When you're zoomed way out to the country or state or city level, you'll see only a few if there are any at all, but as you zoom in, more will pop up. Most of the 4,000+ geoencoded photos are in Japan, but at the moment there are also some in Malaysia, California, Oregon, British Columbia, and Ohio. 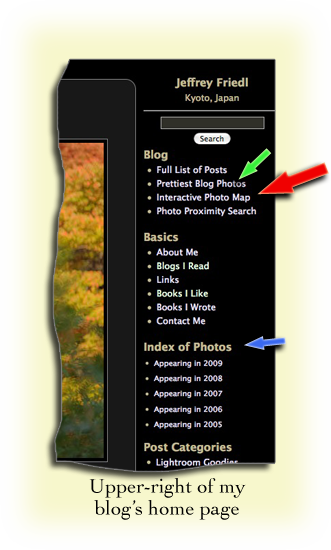 Clicking on a thumbnail brings up a larger version, the date it was taken, and info about the blog post it was from. Double-clicking zooms you up to the immediate area. Sometimes you have to zoom all the way in to see multiple pictures because they're taken in the same immediate vicinity, and sometimes you have to switch to the satellite view to zoom in even further. Often I'll have multiple photos taken from the exact same spot, but only one can be shown. Clicking on it shows a link under the larger version that pops up, along the lines of “there are 20 other photos within 100m of this one”; clicking on it jumps over to my blog's photo proximity search showing all photos in the immediate area. I figure that this will of most interest to the same set of users that find my blog most interesting, which is to say, me. But perhaps the photo map might be useful for someone planning a visit to Kyoto, or wanting to do some virtual sightseeing. 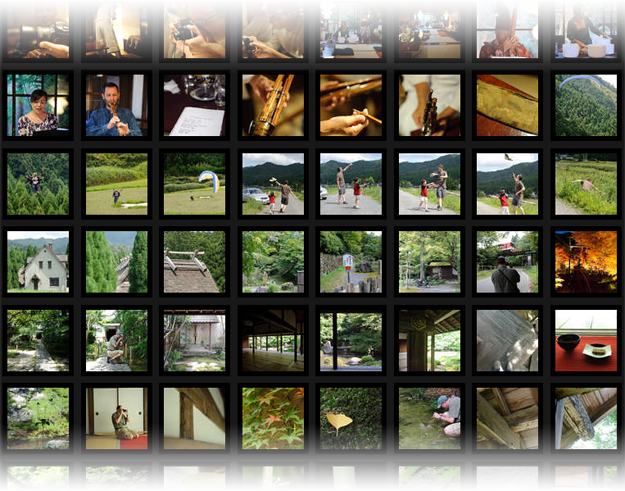 Other ways to browse all my blog-posted photos – not just geoencoded ones – include the Prettiest Blog Photos link (highlighted by the green arrow in the screenshot), which brings up a page of themes (Japan, Autumn, etc. ), each of which brings up a screen full of hopefully-pretty pictures to browse. It'll probably take a while to load the first time. 🙂 Clicking on a thumbnail brings you to the associated post. I build this stuff mostly for myself, but I've put up links in case anyone else might find it interesting. November 4th, 2011 How To Best Export Lightroom Images to an iPad, iPhone, Etc. My wife loves this page and wants her pics of our MicroCredit farmers and Cafe’ kids to show like this in our flash layer on our site. Possible and how long would it take for us to do it? Are you getting a new montor as well since you are not getting the iMac? This is a really great feature. What I’d really love to be able to do is see this for my offline photo database. I’ve heard iPhoto does that automatically, but I don’t currently have a Mac. Not only would an interactive map of all your photos be a really cool thing to have, but it would also greatly help with keywording, allowing easy conversion of GPS data into place names and such. In theory your Proximity Search can already help with this, but in practice geographical borders need to be judged visually so it’s quite fiddly. Jeffrey, do you have any experience with iPhoto? Any advice for how I could implement a map like this? Hi Jeffrey, from Grenoble, France. This is a really cool feature. I have been looking for a solution to do this with Google Maps for quite a while, and I’m sure I’m not the only one!